Thomas Trask was born in 1961. He was commissioned a 2d Lt in the U.S. Air Force through the Air Force ROTC program at Embry-Riddle Aeronautical University on April 21, 1984, and went on active duty beginning September 6, 1984. After completing Undergraduate Helicopter Pilot Training at Fort Rucker, Alabama, Lt Trask served as a UH-1 Iroquois instructor pilot with Detachment 5 of the 40th Aerospace Rescue and Recovery Squadron at Edwards AFB, California, from July 1985 to October 1987. His next assignment was as an MH-53 Pave Low instructor pilot and plans officer with the 20th Special Operations Squadron at Hurlburt Field, Florida, from October 1987 to August 1991, and during this time he deployed to Southwest Asia and participated in combat missions during Operation Desert Shield and Desert Storm from September 1990 to March 1991. 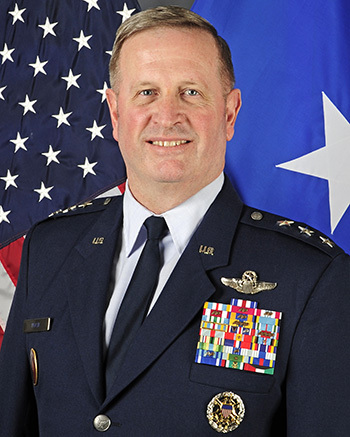 Capt Trask next served as executive officer to the Vice Commander of Air Force Special Operations Command at Hurlburt Field from August 1991 to January 1993, followed by service as a flight examiner and Chief of Stan Eval with the 20th Special Operations Squadron at Hurlburt from January 1993 to July 1994. After completing Naval Command and Staff College at Newport, Rhode Island, and the School of Advanced Airpower Studies at Maxwell AFB, Alabama, Maj Trask served as a plans officer in the Plans and Policy Division with Headquarters Allied Air Forces Southern Europe in Naples, Italy, from July 1996 to June 1998. His next assignment was as operations officer and then Commander of the 20th Special Operations Squadron at Hurlburt from June 1998 to February 2001, followed by NATO Defense College in Rome, Italy, from February to August 2001. Col Trask served as Chief of the Special Operations Forces Division in the Operations Directorate of the Joint Staff at the Pentagon from August 2001 to August 2002, and then served as Commander of the 347th Operations Group at Moody AFB, Georgia, from August 2002 to February 2004, during which time he deployed in support of the War on Terrorism in Afghanistan and Iraq. He served as special assistant to the Commander of U.S. Special Operations Command at MacDill AFB, Florida, from February 2004 to May 2005, and as Commander of the 58th Special Operations Wing at Kirtland AFB, New Mexico, from May 2005 to February 2007. After serving as Commandant of Squadron Officer College at Maxwell AFB, Gen Trask served as Commander of 23rd Air Force with Air Force Special Operations Command at Hurlburt Field from July 2008 to February 2009, followed by service as Director of Plans, Programs, Requirements, and Assessments at Air Force Special Operations Command from February to July 2009. He served as Deputy Director of Theater Plans and Synchronization Element with Headquarters U.S. Central Command at MacDill AFB from July 2009 to September 2011, and then as Director for Force Structure, Requirements, Resources, and Strategic Assessments at MacDill from October 2011 to June 2014. Lt Gen Trask is currently serving as Vice Commander of U.S. Special Operations Command in Washington, D.C. Gen Trask was awarded the Mackay Trophy in 1991 for the most meritorious flight of the year, and he is a Command Pilot with over 3,200 flying hours both fixed-wing and rotary-wing Air Force Special Operations aircraft. Captain Thomas J. Trask distinguished himself by gallantry in connection with military operations against an opposing armed force in central Iraq on 21 February 1991. On that date, Captain Trask, a MH-53J Pave Low helicopter pilot, took off from ArAr, Saudi Arabia in instrument meteorological conditions and flew using unique Pave Low terrain following navigation systems into Iraq to rescue a downed Navy F-14 pilot. This was the first rescue of a downed airman in Iraq, only 30 miles from Baghdad. By his gallantry and devotion to duty, Captain Trask has reflected great credit upon himself and the United States Air Force.